So far, your working directory is only stored on your computer. The working directory (in our case versioned_dir) is not shared with anyone else, and it is not safely backed up in case of disk failure. On top of this, all of the version information about this directory, which is used by Git to move back and forth through time, is saved in a hidden directory called .git. These files contain the full set of metadata that fully describes all versions of your working directory. Note that you should NEVER change or edit any files in this directory, as you will seriously confuse Git and will corrupt your version history. What this means is that if you remove your working directory (e.g. if you type rm -rf versioned_dir) you will also completely remove the .git directory, and thus all version information. Git is providing version control, but it is not providing a safe backup. Fortunately, Git is designed to provide what is called “distributed version control”. What this means is that you can easily put a copy of all of your version information onto another computer, and can even put all of the version information into a Git-based cloud service. Both provide completely free online Git hosting. For this workshop I am recommending GitHub, although don’t take this as any indication that GitHub is better than BitBucket. 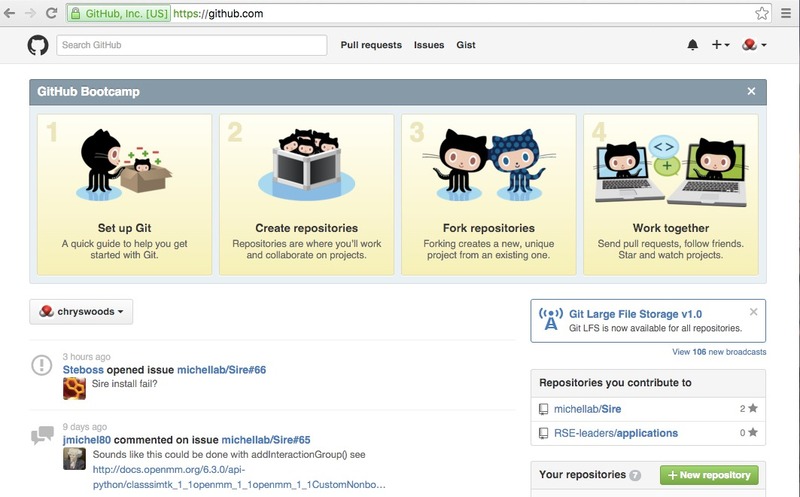 If you haven’t already, please go here for instructions on how to create and login to your GitHub account. This shows your GitHub username (in this example, chryswoods), together with the set of repositories to which you contribute (in your case, probably not many yet, but in my case, michellab/Sire etc.). Repository is the term we use to refer to the complete set of version information about a version controlled directory. A repository contains the complete set of all versions of a single directory (and everything contained within that directory). For example, michellab/Sire is a directory that contains the source code for the Sire molecular simulation framework, and the michellab/Sire repository contains every single version of every file that is in that directory. 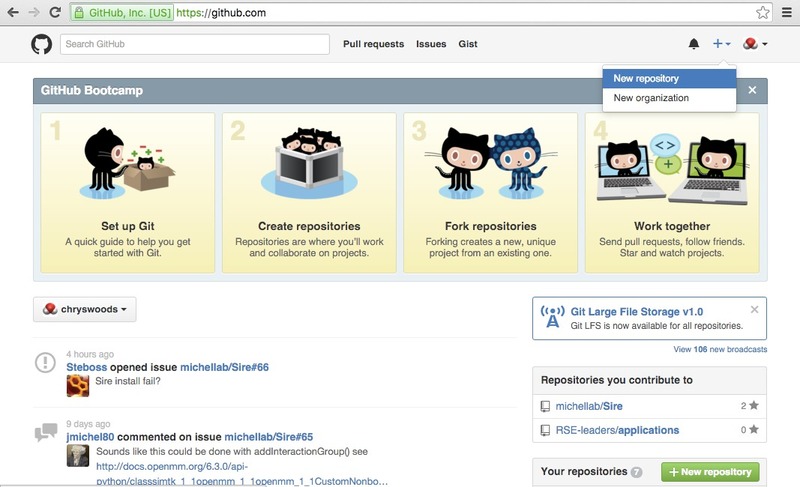 Let us now create a new repository on GitHub. To do this, click on the “+” sign at the top of the screen and select “New Repository”, as in the picture below. Now fill in the information required in the form as in the picture below. Note that “Owner” will be your GitHub user name, and not “chryswoods”. 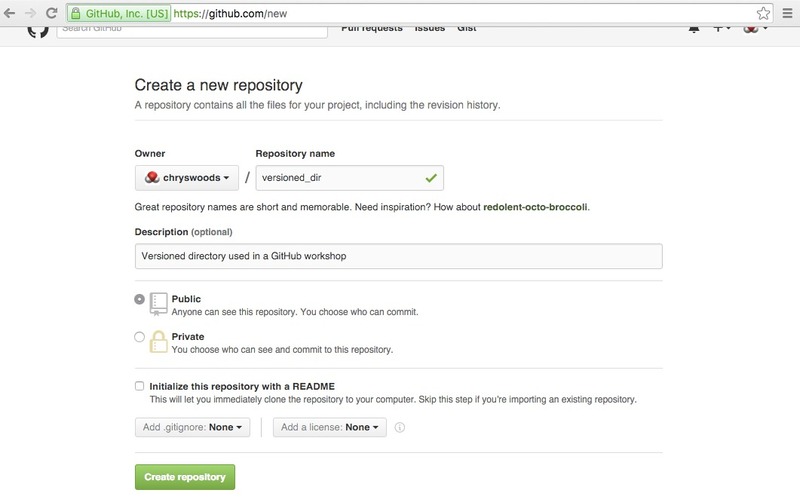 This tells GitHub to create a new repository called versioned_dir, and supplies a useful description. The repository is “public”, meaning that anyone is allowed to read the contents and download it. GitHub allows unlimited free public repositories, but you have to pay for a private account if you want to have a private repository. Click “Create Repository” to create your new repository.